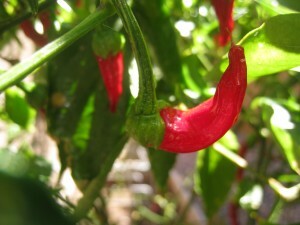 Posted November 30, 2012 Did you know that cayenne pepper provides a stimulant effect that can relieve nerve pain? It has capsaicin, which has the phytochemical that makes peppers like chipotle, jalapeno, ancho, serrano and habaneros hot. Capsaicin relieves pain by stimulating and then immediately decreasing intensity of pain signals which are transmitted to the brain. Capsaicin also blocks Substance P, a neuropeptide responsible for sending pain signals to the brain and causing swelling of nerve fibers. Something that blocks swelling of nerve fibers for a Lyme patient or someone dealing with lyme symptoms is good! As a bonus, it provides powerful antioxidant protection against cancers such as lymphoma and leukemia, according to Memorial Sloan-Kettering Cancer Center. Although I have NO PAIN anymore, been pain free for 3 years now, I sprinkle cayenne liberally on my food. Recipes to follow. Stay strong, be committed to 100% Recovery! Help beat lyme symptoms with cayenne pepper!